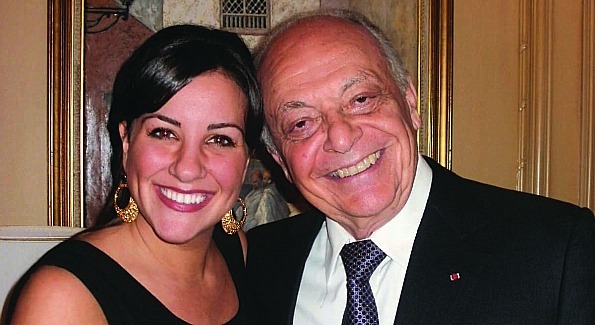 Soprano Joyce El-Khoury and Maestro Lorin Maazel at the Moroccan Embassy Residence. Photo by Gail Scott. RED OR BLUE? : Esther Coopersmith’s gatherings are tantamount to a command on Embassy Row, especially when she recently introduced USAID Administrator Dr. Rajiv Shah and his wife Shivam at one of her signature backyard barbecues (a longtime tradition that goes back to the LBJ days). “Raj is an innovator,” Coopersmith said of the handsome 36-year old physician who formerly worked for the Gates Foundation and was a rising star at the Department of Agriculture until Hillary Rodham Clinton picked him to revamp USAID. Guests, including Agriculture Secretary Tom Vilsack (his former boss), Sens. Robert Bennett and Kit Bond, and Reps. Nita Lowey and John Tanner, were seated at tables hosted by the 22 ambassadors in attendance, including envoys from Japan, Ireland, Netherlands, Egypt, Pakistan, Hungary, Nepal and Kazakhstan. 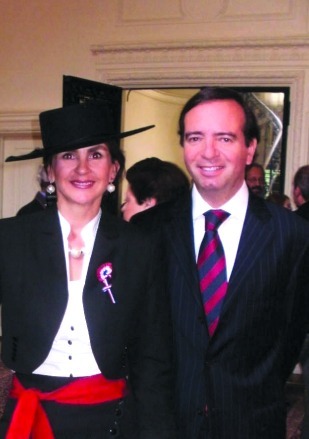 Chilean Amb. Arturo Fermandois and his wife Carolina Santa Cruz at their national day celebration (prior to the miner's rescue). Photo by Gail Scott. DIPLOMATIC BOOST FOR CASTLETON:Hoping to entice arts patron pals to attend the third annual Castleton festival at Maestro Lorin Maazel’s 600-acre Rappannock estate this summer, Moroccan Ambassador Aziz Mekouar and his wife Maria Felice recently opened their Potomac residence to showcase three Castleton “stars of tomorrow,” followed by a sumptuous Moroccan buffet that included chat time with the Maestro himself. SIDEWALK DIPLOMACY: Recently arrived Chilean Ambassador Arturo Fermandois took turned his country’s spectacular rescue of 33 coal miners into an emotion-filled communal experience by means of a giant TV screen in his embassy’s front yard. It turned out to be a good public relations move but the admittedly “nervous and anxious” envoy knew he was also taking a big risk. First of all, the initial predictions were dire: only a two percent possibility that all the miners could be saved. But Fermandois never gave up; he even had iced sparkling wine on hand, ready to pop. “If you have courage, you can get the results you want,” he said, clearly pleased to have already made and a name for himself in Washington and new friends for Chile.